NOTES: All white resin parts. Final height: 27 inches. Stand not included. 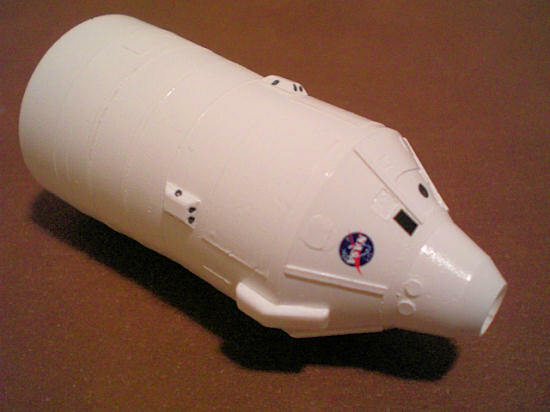 Contains two Orion Crew Exploration Vehicle (CEV) capsule options: Orbital or Lunar. NASA has started developing hardware and systems for the Ares I launch vehicle, which will be used to send 4-6 astronauts into earth orbit and to the International space station after the space shuttle is retired. It will use technologies evolved from Apollo and space shuttle propulsion elements. Ares I will be launched from a modified space shuttle launch pad / tower complex at the Kennedy Space Center starting in the next decade. The Ares I is an in-line, two-stage Apollo style rocket configuration topped by the Orion Crew Exploration Vehicle (CEV) / service module and its launch abort system (LAS). The first stage is a space shuttle based, five-segment reusable solid fuel rocket booster. This booster will be recovered from the ocean and refurbished for use in another launch. The second stage is propelled by a J-2X engine using liquid oxygen and liquid hydrogen for fuel. This stage places the CEV into its final orbit. The CEV and its crew will return to earth in the Pacific Ocean off the Southern California coast. The kit consists of 29 pieces plus approximately 30 reaction control system thruster nozzles for the Crew Exploration Vehicle. The main segments and launch abort rocket were loose, while the remaining pieces were attached to runners. All parts came bagged and in a box. A photograph of a completed kit is on the box cover. The parts are good quality with only a couple of divots to fill and bumps to sand. There are two Crew Exploration Vehicle modules (uppermost stage) provided; an orbital version and a lunar version. The orbital version does not have “reaction control system pads”. A two sided instruction sheet accompanies the kit. The decal sheet contains all required markings and includes markings for a future ARES V kit. The parts are not numbered, but the diagrams on the instructions are sufficient for assembling. Testors grey contour putty was used as needed throughout the build. The entire model was built using “gap filling” cyanoacrylate. I started out by building the solid rocket booster stack. The bottom 3 segments are molded with a through hole. After assembly, the bore is about 7 inches deep, which allows for the model to be displayed in an upright position on a stand. Each segment has a “male” and “female” end for stacking. I placed a few drops of cyanoacrylate around the inside ring of the female end of a segment and installed the next segment into it. The “systems tunnel” feature must line up on the mated segments. The glue dries very quickly, so I lined that feature up before the parts came into contact. Important note: Before gluing the segment that connects the booster to the second stage tank, a test fit is needed. This needs to be done because the mating surfaces on this segment weren’t quite perpendicular to the center line of the booster stack, causing the top half of the vehicle to be crooked relative to the booster. (A small amount of error is exaggerated by the time the CEV section is attached.) Perform the check as follows: With the booster upright, place the inter-stage segment on the booster with the second stage tank on top of that. Stand back from the model and look at the stack to see if it is leaning, and if so, in which direction. Sand down the inter-stage segment as needed to get the 2nd stage straightened relative to the 1st stage. When satisfied with the line up, glue the interconnect stage to the booster stack. Next, I glued the 4 rocket motors to the launch abort system (LAS) tower and glued the reaction control system (RCS) pads and other small parts as required. The RCS nozzles were just a bit to small for me to work with (about 0.060” diameter), so I opted to leave them off. You’ll want some very sharp tweezers, sharp eyes and patience if you choose to install them! Preparing the ring that connects the second stage tank to the CEV section required a bit of work. It was molded such that there was a disk of material across the entire diameter, about half the depth of the ring thick. This disc needed to be removed because both the tank and CEV both have a “male” feature. First, I drilled a hole in the middle of the disk, and then cut out the remainder of the material along the edges with an Exacto knife. I sanded the inside of the ring reasonably smooth with sandpaper (A Dremel tool would also work well). The ring took a lot of extra handling and did not break. I glued the ring to the second stage tank and puttied as needed. At this point I painted the booster, CEV, LAS and main tank prior to their assembly (Painting details below). Prior to painting, I drilled a hole into the end of the second stage tank and CEV. This allowed for the insertion of a dowel to hold these parts while spraying. Assuming it would be easier to handle the booster stack without everything above it attached, I decided to paint the booster segment rings and apply the decals. I also applied the decals to the Orion CEV at this time. For the final assembly, I scraped the paint off of all mating surfaces. With the booster positioned vertically on its stand (see “stand fabrication” below), I glued the second stage tank to the booster, the CEV to the tank and the launch abort system to the CEV. I placed the LAS on top of the CEV, ensuring it was in line with to the rest of the stack. I then applied a couple drops of cyanoacrylate to the seam. 1. Assemble first stage booster segments. 2. Attach interconnect segment to first stage after a straightness check with second stage components. 3. 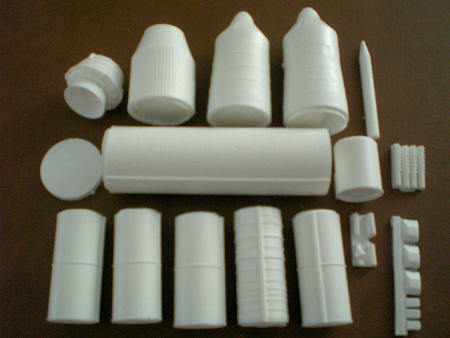 Attach the LAS rockets and other miscellaneous small parts. 4. Attach interconnect ring section to the second stage tank. The stand was designed to display the model in an upright position. The base is aluminum, 6” square, with a 6” long, 0.390” diameter aluminum post bolted to it (Thanks for your machining & fabrication expertise John). 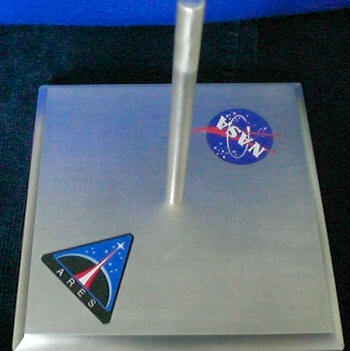 The Ares and NASA logos are affixed to the base with glue stick. The first stage booster, CEV and LAS were airbrushed with Model Master insignia white enamel. For the second stage main tank, the kit instructions provide a suggested ratio mix of 3 colors to produce the brown shade. I didn’t have all of the colors called out in the instructions, so I mixed brown, yellow and a bit of orange, until it looked close to the shuttle main tank color in several pictures I used for reference. Each booster segment has a molded, raised ring. I used Scotch magic tape to mask above and below each ring and then hand brushed them with black enamel paint (red for the top stripe). The same approach was used for the brown rings at the lower portion of the booster. The rings weren’t perfectly smooth, so a bit of re-masking and touch up was needed in spots. I used an Exacto knife to scrape away any black paint that had worked its way under the tape. With the resin being white, only minor touch up of the white paint was required after the stray black was removed. This portion of the project required some patience and took a fair amount of time. The very bottom red stripe (not a molded ring), is located just above the cone shaped aft shroud. Masking for that stripe along the cone was not going to be easily accomplished without cutting a specially shaped mask, so I decided to break into my spare decal box for that stripe. · CEV thruster nozzles pads: A dab of black paint where the nozzles would have been placed. I did not apply clear coat to the completed model. The decals were very easy to work with, needing only about ten seconds in water to slide off the sheet. The model surfaces were smooth and the decals set well, so I did not use setting solution on them. The instructions clearly illustrated the location of the decals. For use as a locating template, I cut a strip of paper to a length that matched the circumference of the booster including the width of the raised system tunnel feature. I then marked off the strip in quarters. These marks were used as a reference to locate the decals around the booster. The raised booster segment rings prevented the placement of each of the words “United” and “States” as one piece on the model. The letters were cut out either individually or in pairs, depending on their location on the booster. I used a straight edge to align the letters as they were put into position on the model. After the decals were in place, the carrier film between the letter pairs was sliced using a razor blade and lifted off using a piece of tape. For the CEV windows I cut out two small black squares from my spare decal stash. Total time to build the kit was approximately 30 hours. The stand with logos took about 4 hours. This was a very nice kit. It was straight forward to build with parts that fit well. A bit of extra work was required to get the second stage lined up straight with the first stage booster. The completed kit looks good. Give it a try if you are interested in real space vehicles and have intermediate modeling skills and experience. Various pictures of Space Shuttle main tanks and solid rocket boosters.